Does anyone know where I can get a case like this? This comment was posted to reddit on Mar 15, 2016 at 6:58 am and was deleted within 19 minutes. Best Write a comment IcanCwhatUsay • 12h You could always print one. 8 effae_ • 45m Thanks for this idea! Very cool. 1 brainstomp • 15h I made one from a Pelican Case by cutting out the areas I needed to carry each item. Works great. I'll look up the case # when I get back to my room and post it here later. 9 nobodysawme • 13h I want to know which pelican case # you used. 2 brainstomp • 7h Well I can't find the model number (it was on a label I removed a long time ago). The closest analog to it is the 1015. Mine is black and has a removable foam insert. I took the insert, and cut around the areas I wanted to make void with an x-acto knifeand just carved it out to fit tightly. I travel with it all the time and it keeps everything I need quite nicely. The only thing I would do right now to it is replace the foam as it has seen 3 years of use and the head is not as snug fitting in it as it used to be (I drilled a hole for the threads on the foam and that hole is not even close to the size it started as). 1 brainstomp • 7h Looks about right, but it is only 1/2 inch deep on the inside, so if it is anything like mine the total inside depth is then halved for the top and bottom each, thus leaving just 1/4 inch of depth so the threads on the head may bottom out. 1 Philosofikal • 10h This is an awesome idea, actually. I can make a custom one for $10 or so. I looked into a similar case for IEMs a while ago, these would be perfect for a razor. - never thought about that. Please post the model if you can find it. Thank you. 1 brainstomp • 7h Well I can't find the model number (it was on a label I removed a long time ago). The closest analog to it is the 1015. Mine is black and has a removable foam insert. I took the insert, and cut around the areas I wanted to make void with an x-acto knifeand just carved it out to fit tightly. I travel with it all the time and it keeps everything I need quite nicely. The only thing I would do right now to it is replace the foam as it has seen 3 years of use and the head is not as snug fitting in it as it used to be (I drilled a hole for the threads on the foam and that hole is not even close to the size it started as). 4 TheManWhoDoneIt • 14h Just do a search on ebay, you can find cases floating around. Because I'm a nice guy I'll help you heres a case i searched "vintage safety razor box". You're welcome. 3 Philosofikal • 14h That case is priced as much as a full razor, and looks like someone stomped on it in the mud. I would prefer something if not new, at least not older than my seventy year old dad. -9 moogooguydan • 14h Most cases since the 50s/60s are plastic and few of them held up well unless you find something NOS. And if it's NOS it's probably going to be expensive. A lot of guys have used altoid tins or similar metal cases and cut foam to fit their razor parts. That is probably your best bet if you don't want to spend much money or time searching ebay. 3 TheManWhoDoneIt • 14h Altoid tins sound pretty nice actually. I think i might have to try that. 1 moogooguydan • 14h Do a search in this sub, there's been several of them posted before. 3 loneblustranger'58 Fatboy • 8h priced as much as a full razor The starting bid is $10. I've never seen any razor for $10, much less a vintage Gillette. 1 50_shades_of_wheyStandard, 39c, EJ89, and assorted vintage Gillettes • 3h Techs and News go for around that price fairly often. I've gotten both of mine in great condition for $9 and $12 including shipping, they just needed to be cleaned up a bit. If you keep your eyes out you can find great deals. 1 Philosofikal • 15h I looked all over eBay and Amazon and could not find a reasonably priced case in this style (because none of them came without a razor). Saying "lol ebay" is not helpful unless it comes with a link. -21 Assface_McGraw • 13h Are you helpless or something? Go to eBay, use your imagination in the search bar, purchase case, profit. Vintage cases have held up as long as your 70-year-old dad because they're well built. You can always polish them up to make them look presentable. 4 Philosofikal • 12h No, I simply made the error of assuming that a community of 75,000 people knows something I don't. Next time I will simply assume instead that everyone else is ignorant, find out the information myself, and not share said information, because that is simpler than putting myself at the mercy of smug redditors. 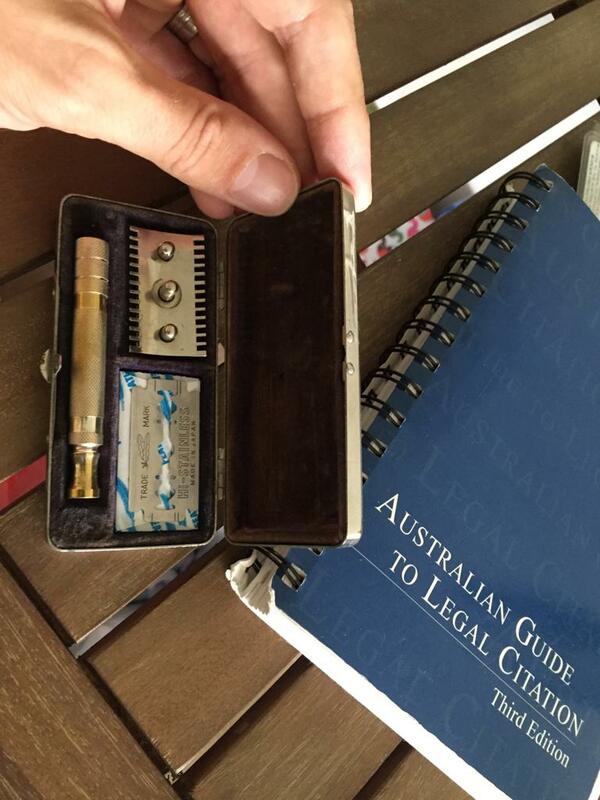 -12 Assface_McGraw • 7h As far as I'm concerned you continued to disregard significant input from other users and bickered that the suggested cases were old though the picture you provided clearly contains a vintage Gillette case. I'm sorry we let you down. I hear Google's search bar is a useful tool. 1 uhglysr's it is not the destination, but the ride to get there. • 7h well since most of are capable of using the search function we assumed you were too. you never asked for a new production case, so why would we not just assume that you were looking for a vintage case as implied in your photo. 1 TerryYockey • 6h Feel free to leave. It is almost unheard of for a user to be downvoted in this sub, and you are being slaughtered with downvotes - I think the fact that you acting like a gigantic tool has a lot to do with that. 1 Philosofikal • 6h Who cares what you think? Karma is a joke, and if you believe it is useful to punish unpopular people, so are you. You're the only person worse for wear because you're mad, I got everything I wanted. Ha ha. On the internet, I don't have to be polite to people who think I am stupid and lazy, because I am not. If you want me to be nice, post actual information like the guy who linked to the Pelican. "vintage de case ebay" is already plainly obvious. I want model names, or at least specific terms. I know this sub has this information because I see plenty of borderline obsession over things like Gillette model years. -4 OutrideGaming • 0m You seem to be forgetting something (outside of basic common-sense politeness and respect). I'm rather new around, and you seem to just want to be spoon fed and to have an attitude where you think you're the only one that's right and we're all here to serve you. Reddit doesn't work that way, none of the internet does, specially not this /r/. Here everyone helps each other out, even the dumbest questions (some asked by myself) get upvoted because everyone's happy to help. I hope that works with your high horse. I found it within 5 minutes of basic research. I even got annoyed with shop on Google and went straight to Etsy. Probably out of line, but totally worth it. 15th century medieval razor. Pretty sure this is the oldest razor in the collection drawer. those heavily-discounted Thiers-Issard str8rzrs are (ahem) 'just fine" (to FR standards)...One of the two's scales are garbagey & it doesn't remotely come close to resting upright on a table. But its edge wasn't bad at all & I've just honed it to HHT-4 without a huge fight. [SOTN] Scentsless acts of shaving. Utterly terrible CS and QC at Rockwell Where to get Yaqi razor stands? For you penny pinchers. New brush brings lather problems Curious... why all the feminine fragrances being used in men's shaving soaps and creams? Trouble setting bevel on vintage straight razor Shaving with Acne/ Aftershave Are there razorblade fanboys? How does one shave around the shaft? I need advice, preferably from someone who has used a Futur. Gifts for a shaving obsessed boyfriend RAINBOWS & UNICORN Chalkboard I drew for Dr.Bronner's Magic Soap SALE! Great Pre-shave Soap!